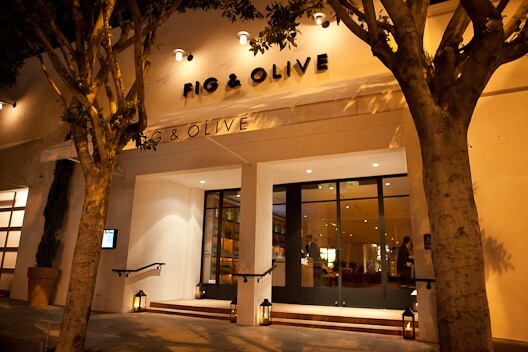 Fig & Olive was my DineLA pick for this season! I get so excited when DineLA comes- it’s a great excuse to dine out at a restaurant you’ve always wanted to go to, for a more reasonable deal and price. (If you don’t know what DineLA is, look at my previous post for info). I’ve been wanting to go to Fig & Olive, especially because President Barack Obama dined there when he was in LA, so if it was worthy for him, I thought it was worth going to lol. Their DineLA fixed dinner menu costs $44. We had a 8:45pm reservation on a Thursday night, and the place was jam packed. The atmosphere is amazing there. It’s trendy & chic and had a great vibe. The food was good too. Not exceptional by any means, but good. This was my favorite part of the whole meal. I loved these crostini! Next time I go to Fig & Olive I can make a meal out of the different crostini they offer with a nice glass of white wine. I loved all three we ordered. The flavors were amazing and fresh tasting. Each one is so unique and delicious. Highly recommend ordering a couple different kinds of crostini, they have a bunch of combinations to choose from. This was another great dish. The thinly-sliced beef literally melts in your mouth. Great flavors with the truffle oil and parmesan too. The tomato and arugula added the perfect texture. Although it was not offered on the DineLA menu, I heard the bass at Fig & Olive was amazing so I came to the restaurant already planning to order it, and our server recommended it so it sealed the deal. It came to the table in a steaming “puff” paper bag on a plate. Our server cut the bag open and folded over the sides. It was quite the production actually, the presenation was very unique. They cook the bass in the paper bag so the flavors of the vegetables and sauces really marinate the fish. The flavors were great, loved the marinated vegetables with the fish too, but the fish itself wasn’t extraordinary for me. I was expecting the texture of sea bass which is silky, melt- in-your-mouth tender, and easily flakey when you touch it with a fork. This striped bass was not as tender and it wasn’t that melt-in-your-mouth texture I was hoping for. Although the flavors were there, as well as the unique presentation, I felt something was missing. I’ve had better fish before. These crab cakes were very delicious! I loved the chili aioli. Really great dish, highly recommend if you like crab! This was one of my favorite things I’ve ordered at Fig & Olive. It literally melted in your mouth and I loved the profound truffleness of it. (I made up that word lol). So amazing!!! Previous PostWINTER 2012 DINELA WEEK!